Several years ago, an architect I know and have worked with before introduced me to a client of his whose home renovation was nearing completion. 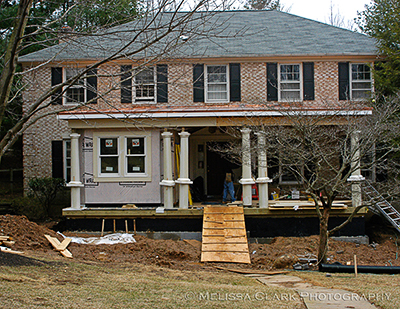 Most of the work was a beautiful interior renovation; the only changes to the exterior consisted of adding a porch and a cleverly-disguised laundry room on the front of the house. In the course of construction, as is often the case, the plantings around the house had taken a beating, including a dogwood tree and some azaleas. The entire place needed a make-over. But there was one small catch, which is detectable from the photo above if you look closely at it. The lot sloped dramatically (OK, the drama isn’t visible from this shot) from the left side of the house to the right, beginning with a very large hill on the left property line, and ending in a county culvert on the right property line. Strong rainstorms had always cut a gully line right in front of the house, turning the area into a muddy mess and eroding the soil or any semblance of a lawn. Enter the concept of the dry streambed. 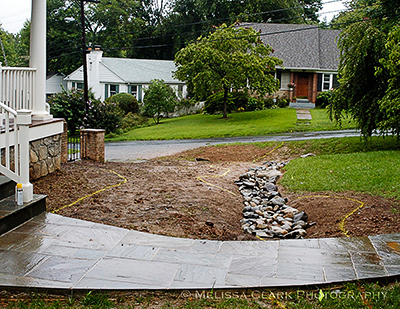 We decided that creating a “channel” of large (5″ – 8″) river jack stones and boulders (and adding the same material to the bare county culvert at the bottom of the property) would slow down rainfall when storms hit and allow me to design planting beds around it with plants that could withstand periodic flooding. The contractor had already built a mortared flagstone walkway over the portion of the “gully” area right in front of the steps, so we had to excavate underneath it and place perforated black pipe that would facilitate the water draining from one section of the dry streambed to the next and down to the culvert. The dry streambed snaking under the pre-existing walkway. Yellow paint lines outline the planting beds on either side of the streambed and the foundation of the house. The streambed was designed to funnel water down to a county culvert, at the foot of the hill, that parallels the side street. 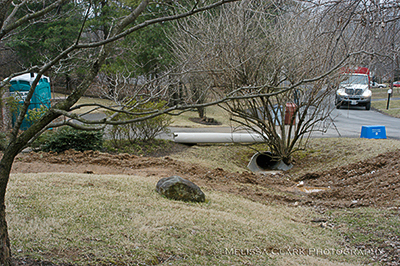 A county culvert on the side of the clients' property added nothing to any curb appeal of the property. The owners wanted a front garden that was as appealing as the makeover their home’s interior – and exterior – had received. They also knew solving the drainage problem was paramount. Next week: the garden, five years on.